After much thought I’ve decided to close down the forums. It’s been a long time running. These forums in their original form where the social media of its day. We had some good times and not so good times, but what most of us had in common was that we liked Bay’s movies. I first started the first forums back on Xoom.com in 1998 around the time of Armageddon came out; that’s 20 years ago! Anyway, I would like to thanks all of you who made it fun with your posts and hung in there. I would especially like to thank those that helped out when this was a fan site, with moderator duties, such as Greg, Andreas, The Great, and the amazing Sora. These forums will close in the next 24 hours. You will still be able to follow us on Twitter and Facebook. If you wish to interact on with me on Twitter, you can do so by tweeting @S4TEWebmaster. 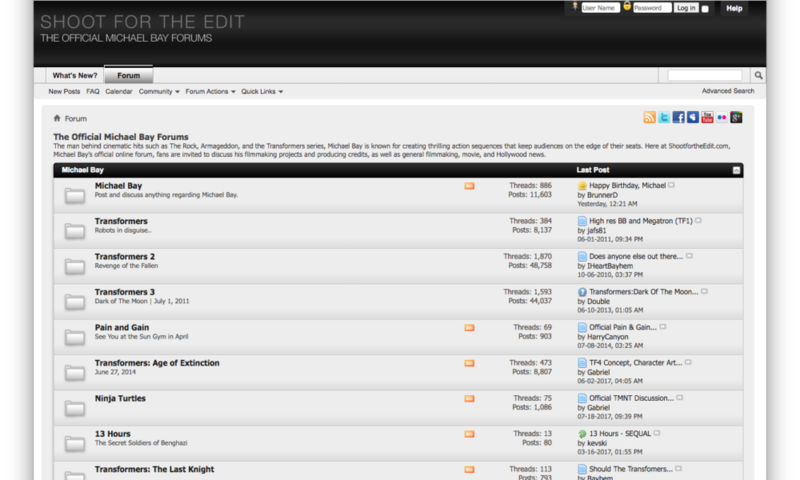 The main site www.michaelbay.com, as always, will be up. So, goodbye and thank you from the bottom of my heart; it’s been real.